Avoid Disappointment And Reserve Now! Our prices will be increasing in the coming weeks so now is the time to reserve! With apartments currently available from just �42,900 now is the time to secure a property in this stunning part of Borovets. We have just started construction on Chamkoria Chalets and you can view our construction gallery here. You can check the gallery to see regular updates on progress. Our Phase I Chamkoria Chalets are now sold out but we will soon be launching a further 10 chalets in Phase II. These are in the same location and offer the same stunning views of the Rila and Vitosha mountains. Contact Us now for further information and the most up to date prices & availability. AerLingus have recently announced a new route from Dublin to Sofia which will start this October. 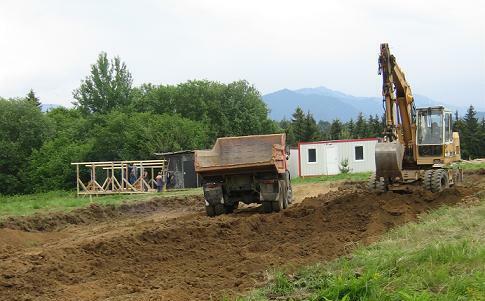 We are happy to announce that we broke ground for Chamkoria Chalets this month. It was a great sight to see and construction has been progressing well since. There has been a few thunderstorms and some heavy rain this month which has slowed progress slightly. Nevertheless excavations are ongoing and some of the first foundations have been poured. Click the image above to view our construction gallery. The Samokov Municipality has recently announced the reduction of build density and lowering of maximum build height for properties in Borovets. This is good news for the area and very good for our views in Chamkoria Chalets! This reduction is no doubt a valuable lesson learnt from other resorts such as Bansko & Pamporovo which have suffered from overdevelopment. Work continues on the first gondola under the Super Borovets plan. Those of you familiar with the Super Borovets plan will know that this gondola is located just outside Samokov and is part of the Stage 1 � Lower Borovets plan. This 10km gondola will transport skiers to the Yastrebets and Markudijik ski areas. This area will target both local & foreign tourists looking for a more affordable skiing holiday in the lower part of the resort. This gondola is expected to be ready for the ski season of 2009/2010. 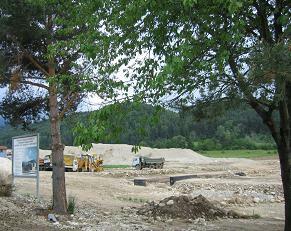 We will keep you updated on the progress of this gondola and the other Super Borovets improvements.